Between Stitches: half way there! It's darker than I thought it would be now that I've thrown some blocks on the floor - so I made make some lighter blocks to add in the mix. Oh, and don't pay any mind to my blue sock and black sock. The tootsies are warm, and on this stormy and wet day - that's all that counts! 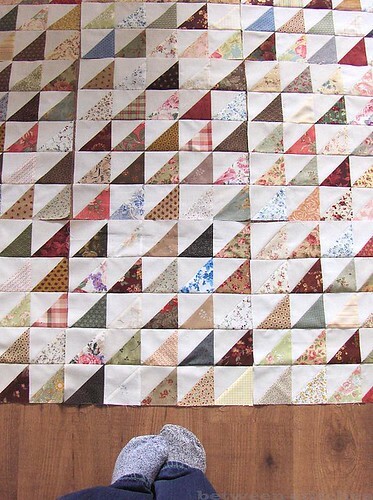 What a lovely quilt Heidi - I wouldn't mind snuggling up under that one day! Odd socks are fine - I had two pairs of identical shoes except one pair was black and one pair navy and yes you guessed it I went into work one day wearing one of each. And I don't think anyone noticed! Heidi, it looks like this will becoming a beautiful quilt! Your triangles are very nice. I really think a colorful one patch quilt is so very nice - this is great. Now if you would not have said that you had on a blue and a black sock I would not have noticed or kept looking. Good sign I guess that you are too busy quilting to pay attention to getting dressed??? LOL! Gee now I can hear you laugh literally and it was fun to actually TALK to you the other day. The quilt is really coming along great. It is looking really nice and I don't think it is too dark at all but then again, I love dark and rich colors. Have you decided to concentrate on only this for now or also doing some work on a UFO from your confessions? Wow! Wow! Wow! I love it! It is really beautiful! I would snuggle up under it no problem! Wonderful triangle quilt. I'm about to start a small one myself.